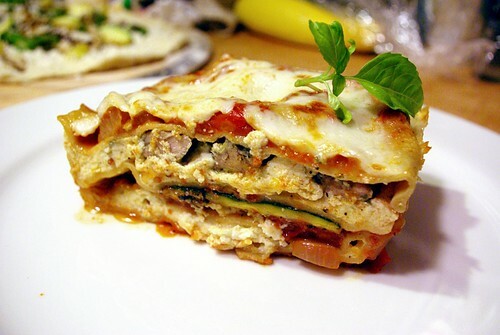 whole wheat pesto pork and squash lasagna, originally uploaded by aarn! +21st May, 2009+. started a quick sauce by sautéing a medium-sized vidalia onion in a splash of olive oil, then adding salt, pepper, bay leaf, and thyme. after that simmered for a bit, added three cloves or so of chopped garlic, then after the garlic was giving off a nice aroma, deglased the sauce pan with 1c. or so of red wine. when the wine was almost fully reduced, added a quart can (yes, a can, short notice meal here) of peeled plum tomatoes. after the sauce cooked for a bit, a potato masher was used to break down the tomato solids. reduced this sauce for about an hour while the rest of the meal was being prepared. grated 3/4-lb of low-moisture whole milk mozzarella. mixed together 1-pint of whole milk ricotta cheese, 2 eggs, 1/2-lb of the grated mozzarella, salt and pepper. set aside the remaining 1/4-lb of grated cheese for topping the lasagna. in a food processor, chopped 1-clove of garlic, 10-15 basil leaves, 2-3T. pine nuts, salt, and drizzled olive oil in until thick and pesto-ish. grilled quartered zucchini and yellow squash which had been tossed in salt, pepper, and olive oil. also grilled 3/4-in strips of pork sirloin which had been tossed in salt, pepper and olive oil, until only about 50% cooked, then pulled them and tossed in the pesto. mixed together 1-lb of white whole wheat flour and 5-eggs, adding a little olive oil and salt, and then a splash of water to get it to the desired consistency. tossed this in the refrigerator to firm up for a few minutes, then rolled out into sheets, cutting the sheets to size and layering the lasagna as it was rolled. This makes me so hungry. Mmm I love non-standard lasagna. So many unique combinations it's fun to see which ones work. Sounds absolutely fantastic! Sorry I am visiting sporadically right now, just a lot of work and deadlines. But this...this was perfect to see after a whole day of baking! Thanks for checking out the blog...I did a little poking around and I like what you have been doing on your site. Check back in soon. Thanks! I have been really busy lately as well, but have been noticing your recent posts in my reader and they look great! I have been cooking a lot, but either it wasn't the right setting to take a picture (like a busy bbq, etc.) or the photos just didn't turn out, keep checking in, hopefully I will have some good stuff to show-off soon. This lasagna sounds really tasty!